After the recent presidential election, you are probably either particularly alarmed or especially excited about the outcome. Regardless of your particular political predilection, it is fair to say that this election puts data science on its head when so many got so wrong. On an earlier issue of Harvard Business Review, the venerable magazine shared a piece of research from the University of Southern California on forecasting. When forecasting sales, the best estimators use a combination of intuition and logic – with both the logic-heavy and intuition-heavy forecasters performing less accurately. In the age of artificial intelligence and big data, it can be sobering to realize that despite the staggering volume of data we are now collecting, ignoring your gut instincts can take a heavy toll on your decision-making abilities. 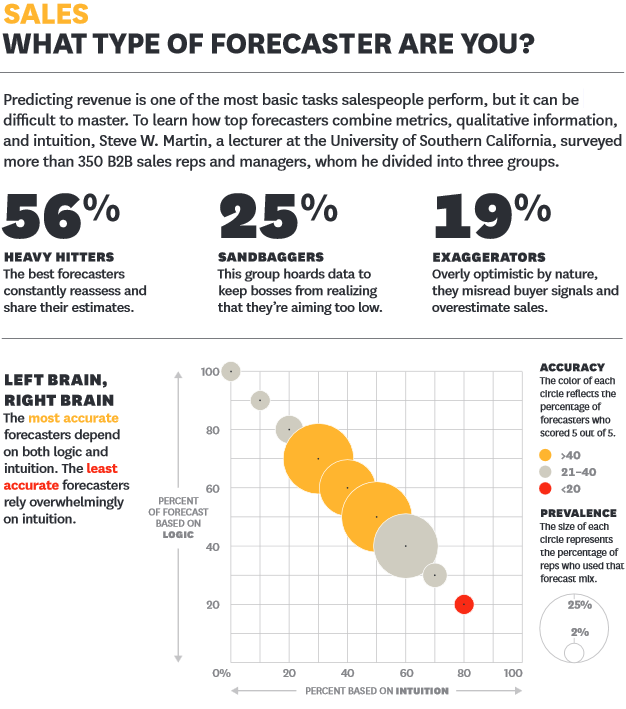 Source: “What type of forecaster are you?” Harvard Business Review (March): 26. This entry was posted in Figure Stuff Out, Technology and Informatics and tagged Data science, Predictive Analytics. Bookmark the permalink.